Bayer Leverkusen welcomes Augsburg in a match from the 14th round of the German Bundesliga. Here are our thoughts about this game at the BayArena in Leverkusen. At this moment Bayer Leverkusen are 11th in the Bundesliga standings with 15 points won and a record of 4 wins, 3 draws and 6 defeats. In their last five games Leverkusen are pretty inconsistent – 2 wins, 2 losses and one draw. In their last game Leverkusen shared the points with Nurnberg away from home. The game at Max-Morlock-Stadion ended with a 1-1 draw. Kai Havertz opened the score for Leverkusen, but Georg Margreitter equalized for Nurnberg soon after the halftime break. Before this draw, Heiko Herrlich’s team enjoyed a home win against Stuttgart. Augsburg are in a difficult position at the moment. They are 14th in the Bundesliga standings, but being just 2 points above the 16th Stuttgart and the relegation playoff zone. Right now Augsburg are clearly not in their best form, losing all of their three last games against Stuttgart, Eintracht Frankfurt and Hoffenheim. If they continue like this, Augsburg could find themselves in the relegation zone pretty soon. They need a positive change and they need it fast. In their last game Augsburg lost their visit to Stuttgart with 0-1. The only goal in the match was scored by Anastasios Donis, who put the ball behind Andreas Luthe’s back few minutes before the halftime break. 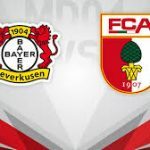 For this game Bayer Leverkusen can’t use the injured Joel Pohjanpalo, while Sven Bender, Karim Bellarabi and Panagiotis Takis Retsos are doubtful for the clash. Meanwhile Augsburg could be without Alfred Finnbogason, who is still recovering, but the good news are that Felix Gotze could be ready to play. That’s what we had to say about the Bundesliga clash between Bayer Leverkusen and Augsburg. We wish you good luck!